On account of it being my birthday today I thought that I should not do any school so that gives me time to document the whole day for your reading pleasure. The day started very early this morning when, although I was tucked up in bed, there were still noises coming from the kitchen. My girls were making preparations of some sort. At a much more reasonable hour I came down to breakfast: pancakes made by L15 with a pile of presents on the side. The presents are all lovely and some will be featured in this post as I put them to use during the day. One such present was just crying out to be used straight after breakfast. Although it was my birthday and I shouldn’t really be doing the dishes, my children kindly allowed me to try out my new rubber gloves, not ordinary rubber gloves but cool ones with pretty “business” on the ends. My kids are good like that, after I had washed the dishes they also let me clean the stove! 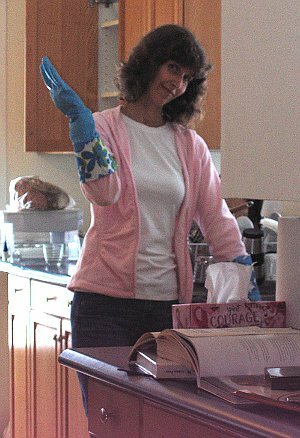 Rubber gloves with business are a big hit. The morning progressed with the girls getting down to work, it’s not their birthday after all, but not B9. He is under the impression that my birthday is like the Queen’s birthday, a public holiday for all. 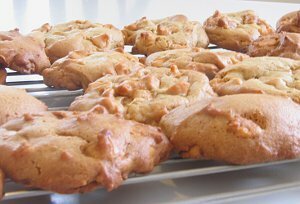 That being the case I decided to put him to work helping me bake Butterscotch Chip Dreams. While I was at the computer updating the birthday business, B9 was setting out yet another edible treat. 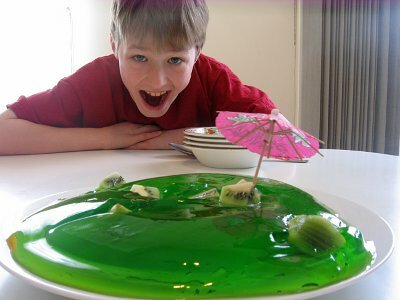 The jelly turtle has always been a favorite of his, but this time it took on a new look becoming instead the jelly lagoon complete with kiwifruit flotsam and jetsam. I was planning to head out around midday to do my birthday laps at the pool but time got away over lunch and next thing I knew the window of opportunity had closed. Despite what one of my children suggested I do not yet qualify for the 50+ Vitality swim! Had I swum I would have put to good use another of my birthday gifts. Whenever I swim I usually return home wearing the alluring fragrance of chlorine. That is about to change. I received a delightful selection of potions from a very pretty store. It came wrapped very prettily also. Apparently business was rather slow when my husband made the purchases and the woman who helped him was only too happy to gift wrap for him. The contents of the box came in a cute little bag (with ribbon) which lay amongst scads of tissue paper in a beautiful silver box (also with ribbon) which was placed in a gorgeous silver bag, which would have been topped off with more tissue paper had not my husband put a stop to it! I think she would have even written the card if asked. This entry was posted in Family, Food, Friends on February 24, 2010 by Heather. Your kids are such wonderful sports, letting you clean on your birthday! Sounds like it was awesome, lacking only a thorough soaking (err, swim). Hope the next run around the sun is as good or better!